Irene Sabatini, was yesterday crowned winner of the 2010 Orange Award for New Writers, for her debut novel, The Boy Next Door. Set in the 80s and 90s, The Boy Next Door is both a love story and historical journey of many layers. It chronicles life from the latter days of Rhodesia to the early years of Zimbabwe, through the eyes of Lindiwe Bishop. Through her protagonist, Sabatini explores the divides within a nation in transition along the lines of race, corruption, love and violence. In her own words, Irene Sabatini and the journey of The Boy Next Door. Belinda: What inspired The Boy Next Door? Irene: The Boy Next Door was inspired by two events. The first, a telephone call I received from my father: a fire had broken out next door. I hadn’t been in Bulawayo for almost five years but the image of the house next door burning was very vivid to me (my parents still live in my childhood home). Then, much later, I had a conversation with an American editor: he was trying very hard to convince me to write a memoir about growing up in Rhodesia and then independent Zimbabwe. I told him, I didn’t want to abandon my fiction writing, but somehow his suggestion sparked off this long, beautiful trip down memory lane: all these images about my girlhood in this sleepy city (the wonderful Public Library, for instance, where I spent many, many hours) the different textures and flavours of it. Then, in one of those mysteries of how a story begins, I was sitting at my desk, a year or so after my father’s telephone call and the very first line of the book came to me….Two days after I turned fourteen the son of our neighbour set his stepmother alight. That line, which has never changed during countless revisions, is the coalescing of the two events that in reality occurred in different time periods- the fire (which became something else in the book, not a house on fire anymore but a person) and childhood. Snatches of memory ultimately gave the young Lindiwe her body and voice, which is not to say that Lindiwe is me! Belinda: Lindiwe’s story serves as a lens for readers to see daily aspect of life in Zimbabwe years back like we have never heard or seen it. What’s the story about Zimbabwe and your background that you were keen to get across to you’re the reader? Irene: I guess one of the most important stories that I wanted to convey (although I wasn’t consciously working towards that as I was writing) about Zimbabwe in the eighties (and nineties) is just how multicultural it was. There was such a heady mix of nationalities: young people, full of energy and good will, from all over the world, who had come with NGO’s or the United Nations to help this new nation find its feet. Zimbabwe was going to be socialist paradise. There were doctors and teachers from England, Cuba, the United States Italy, France…all manner of what Ian calls ‘fundies’, experts. There was Black, White, Coloured, Asian, Shona, Ndebele…and the rest of the world, all squashed up against each other in this (previously) isolated land-locked country; it was a shock to the system for the newly minted Zimbabweans, this sudden international invasion. There was a great deal of optimism particularly in the northern part of the country, in Harare. The situation in the south was different. The image of Zimbabwe being a thriving nation in the eighties has glossed over the massacres that took place during the early part of that decade, what Zimbabweans refer to as Gukurahundi. Lindiwe grows up in Bulawayo which is in the southern part of Zimbabwe, called Matabeleland. Her girlhood is shaped by both the war for independence and the consequent reign of terror when a special unit of North Korean trained government soldiers called the Fifth Brigade was let loose in the south resulting in untold suffering and deaths. Ian is also from Bulawayo, and their relationship is shaped partly by this shared geography and history. Several readers have told me how touched they were by these two teenagers, Lindiwe and Ian, who are able to connect in this very human way during a time of widespread fear in Matabeleland. Belinda: You explore different themes in your book; political disorder, violence, dislocation and dispossession and love, among many others. But one thing that stood out for me was the relationship between Lindiwe and Ian, and what the power of endurance can do. Is that an element of the Zimbabwean society and the world at large that you wanted to question and explore; people’s ability to endure the rough times and still have hope? Irene: To me the relationship between Lindiwe and Ian is the key element of the book, its driving force. I never knew where they were going until they got there. And as their story unfolded, I realised that it was saying something about human relationships, the nature of loving someone through good times and bad, and the resilience of it. It was a learning process for me to watch them struggle with one another and the pressures of living in a country which is falling apart, economically and politically. In a way, I learnt a lot from their struggles with how they perceive each other and how that perception grows and changes over times. They teach each other. Each learns from the other. Ian’s brashness is counterbalanced by Lindiwe’s sensitivity; Lindiwe’s occasional overthinking is offset by Ian’s instinctual reactions to situations. Also, I think it is very difficult for a couple like that to sometimes simply view themselves as two individuals rather than as stand ins for a myriad of cultural, racial and historical issues. The pressures can be so great and yet, they have something that they both believe is worth fighting for and holding on to. Belinda: Who are your influences when it comes to literature or for their writing style? Irene: I read a lot. I go through different phases. For months I’ll just read literary memoirs, biographies. I’ve just read Edmund White’s City Boy; one of my favourite books is his, The Married Man, which is actually fiction: he has a wonderfully sensual way of describing places. And then I’ll be in a phase of only reading books by Russian authors. And then I’ll be into short stories. One of Chimamanda Adichie’s short stories, Ghosts continues to stay with me months after I read it. I can still feel the weight and depth of the professor’s loss and longing: it’s just beautifully written, very poignant. The books I love are those that I feel a very strong emotional connection to, where I do not feel the hand of the author at work. Irene: I don’t work consciously on my style. So, to describe what it is very difficult for me. I’ve been talking to a writer who has been writing for a long time and she was saying that the way we write is a function of our entire lives, everything that has gone into making us the people we are, anything and everything…all my formative years in Zimbabwe, the books I read, the dreams I dreamt, the foods I ate….and then my travels…I find this idea wonderful. I wouldn’t write the way I write if I hadn’t grown up in Zimbabwe…I wouldn’t describe time and space, the sky, a scene in any part of the world or in my literary landscape if I didn’t have those reference points which are embedded in my psyche. I can also try and answer the question by saying how some readers have so far responded to the work, what they perceive my style to be. One has said that I leave a lot of space in my writing for the reader to imagine…. I leave space for the words to breathe. I know that I don’t usually like to read long descriptive paragraphs in books (my brain gets bogged down with adjectives, everything becomes a blur, the emotional intensity of a work becoming somehow compromised by too much telling), so perhaps that’s where the stripped down style in The Boy Next Door comes from. Belinda: The story pulls at you emotionally when reading, especially as things just fall apart in the nation and for the two main characters there is something that tugs at you emotionally about the reality that hits them about the choices they have to make, At least for me. How important is it for you as a writer to bring these kinds of emotional facets into your work? Irene: I want readers to feel, above all, emotionally connected to the characters and the story. If I have achieved this I am very happy. I want them to not only know Lindiwe but to feel her because I think that it is only when this connection happens that a story can really come alive and be true. You can’t imagine how happy it makes me when I’ve had readers come to me and say that they cried at the end, or that they were reading the final chapters with thumping heart wondering what was gong to happen to Lindiwe and Ian. Another reader told me how heartbroken they were that a certain relationship in the book appears irrevocably damaged and that they hadn’t been able to get over that for days. And then several others have told me how intensely they disliked a particular character in the beginning and then how they were won over by him as he grew and changed. To me that’s magic, that’s the beauty of fiction when it works. Belinda: The book is historically rich, I learnt so much about Zimbabwe’s history from reading your book, thank you for that. Did you set out to infuse so much of Zimbabwe’s history when you started writing? Irene: When I began the book I had no idea at all it would have so much history in it, but as Lindiwe’s life progressed in Zimbabwe there was no escaping it. Lindiwe and her family, Ian and all the characters in the book are living through these incredible times in Zimbabwe….flush from independence, then almost another war again, the boom years, the corruption, the hope for democratic change…Once I became engaged in the story the history just became part of it. Memory was unlocked. Belinda: You have lived in different parts of the world; how challenging was it to write about Zimbabwe’s history and how deep did you have to dig into your memory bank for stories and images of Zimbabwe that you carry with you daily? Irene: I was born in Bulawayo and grew up there. I went to university in Harare. I only left Zimbabwe in 1992 and then I came back in 1997 and stayed there until 2002, so for the period that is covered in the book I was mostly there, and because it was such a colourful time once the story unfolded memory clicked into place. Details were much harder to remember but for this there were many phone calls to Bulawayo, books, and the internet. I also listened to lots of music from Southern Africa especially Johnny Clegg and Savuka which seemed to always trigger memories (and homesickness). Belinda: Did you find you were more objective when writing because you have been away from the situation? Irene: That time period in the book, 1980’s to l990’s, is seen largely through Lindiwe and Ian’s eyes. 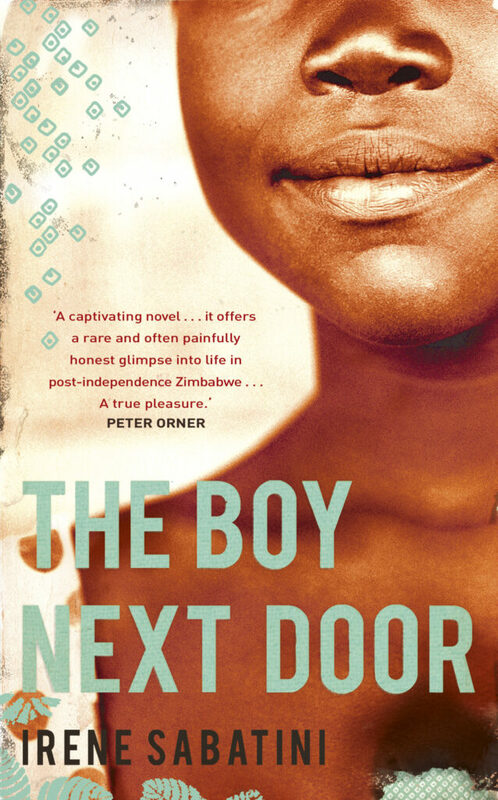 The Zimbabwe that unfolds in The Boy Next Door is the Zimbabwe they live through. I think that being in Geneva, which is very tranquil, gave me exactly the right state of mind to allow the characters the freedom they needed to act and react to situations and events. Belinda: What do you want readers to take away from the book after reading The Boy Next Door? Irene: I would like readers to take with them the very real sense that loving someone, being a family, may require a lot of stamina. That it is always a work in progress. Note: The Boy Next Door has Dutch, Swedish, German and Norwegian editions. It is also available as an audio book. Belinda’s Note: As a journalist, you are trained to remain neutral but allow me; this is one of the best books I have read within the last year, in addition to other female writers. They have all written fantastic books, which I have enjoyed reading and reviewing for the New African Woman. I appreciate your intellect and warmth, and the interviews you have all given me. You may never hear from me again…that’s not true because I look forward to reading what you are going to give us next but in the meantime, I would like to use this opportunity to say – Irene Sabatini, Chika Unigwe (You know I love you) Laila Lalami, Nadifa Mohamed, Maaza Mengiste, Sarah Ladipo Manyika (You are the best and thanks for being so proud of me. Love you too) Yaba Badoe, Adaobi Tricia Nwauabani, Lebogang Mashile, Tolulope Popoola, Aminatta Forna and Petina Gappah – thank you all for the interviews and insight on what it means to be a writer. I do not make it a habit to ask difficult questions but it is always so pleasing to read your responses. You all make it so cool to chase after your dream and never apologise for it. This entry was posted on Thursday, June 10th, 2010 at 4:16 am	and is filed under Africa, Book Reviews, Interviews, Journalism, People. You can follow any responses to this entry through the RSS 2.0 feed. You can leave a response, or trackback from your own site.